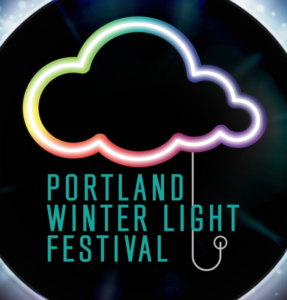 The Portland Winter Light Festival (PDXWLF) is a Willamette Light Brigade event, and aims to counteract the city’s tendency to hibernate during the winter. The festival brightens up the winter skyline and brings warmth to the outdoors with dazzling displays of light, color, and imagination. Bundle up and celebrate with us! The PDXWLF is interactive, family-friendly, and designed to inspire adults and kids alike. Combining art and technology, people of all ages will find something to capture their spirit and fill their minds with imagination and wonder. The festival takes place at locations across the city of Portland, Oregon.